No examination of the last century in New York music would be complete without a nod to Brooklyn’s outsized influence of late. 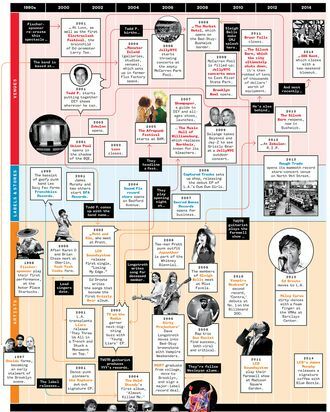 Here, our handy timeline traces the key labels, stores, venues, and artists of the past 20-odd years. From Afropunk to electroclash to Zebulon, click to launch an abridged tour of the borough’s millennial moment.